Every season over the past decade, efficacious thrips insecticides have been commonly applied for control of Thrips hawaiiensis on banana crops in China. For effective thrips control, some insecticides have been used extensively against the thrips in numerous banana plantations. This study aims to examine the current resistance status and the dynamics regarding the changing frequencies of resistance in the field T. hawaiiensis populations. 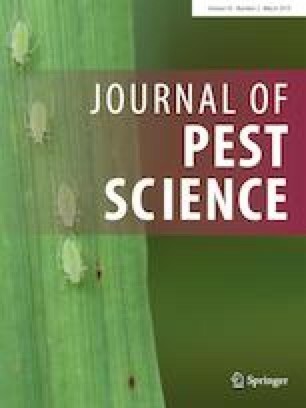 A total of 13 field samples from banana orchards (Chengmai, Lingao, Dongfang and Ledong located in Hainan Province, China) were collected monthly in 2014 to 2017, and selected individuals were used in bioassays assessing insecticide resistance and metabolic enzyme activity compared to a laboratory-susceptible strain. In 2014, the initial resistance survey found that all sampled populations were susceptible to spirotetramat and cyantraniliprole, while Lingao and Chengmai population showed a moderate resistance to imidacloprid, acetamiprid, abamectin and spinetoram. Further, seasonal and annual analysis of resistance dynamics with imidacloprid, abamectin and spinetoram demonstrated that resistance in field populations of T. hawaiiensis developed quickly within a season (from April to August 2016), but resistance was unstable over subsequent seasons (April 2015, 2016 and 2017). Moreover, synergism experiments using enzyme inhibitors together with metabolic enzyme assays revealed that field-evolved insecticide resistance in T. hawaiiensis was closely associated with the elevated metabolic enzymes. The observed resistance increase within a season was attributed mainly to the intense use of these insecticides and short generation time of thrips. These findings suggest that a rotation system using efficacious thrips insecticides should be implemented for sustainable thrips control to reduce the potential of resistance development. Buli Fu, Haiyan Qiu and Qiang Li have contributed equally to the study as the co-first authors. The online version of this article ( https://doi.org/10.1007/s10340-019-01112-w) contains supplementary material, which is available to authorized users. We are grateful to Shanguang Li, Xiya Xia, Yantang Sun and Haifeng Jin for their help with the collection of the field population and their assistance in the bioassays. This research was supported by the National Key Research and Development Program of China (Project No. 2017YFD0202100) and partly supported by the Special Fund for Basic Scientific Research of Central Public Research Institutes of China (Project Nos. 1630042017010 and 1630042019007). We would also like to acknowledge the anonymous reviewers for their constructive and valuable comments.